You'll need just five minutes and three ingredients to make this tasty coffee drink. Share it with your family for a special treat! Empty cocoa mix into 2 large mugs or cups. Add coffee; stir until mix is dissolved. Prepare using MAXWELL HOUSE Italian Espresso Roast Coffee. 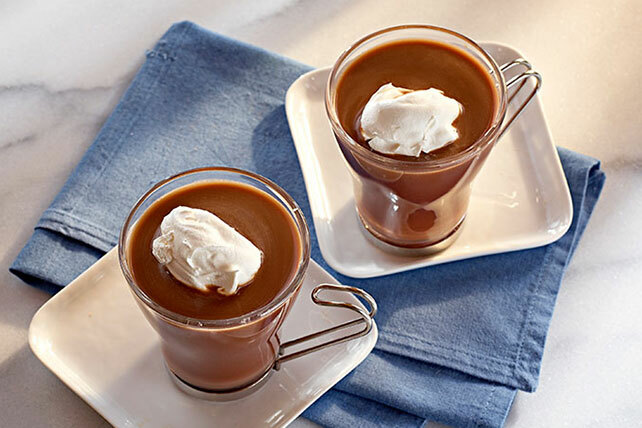 Prepare using instant reduced-calorie hot cocoa mix, or flavored instant hot cocoa mix. To serve garnished with shaved chocolate, pull vegetable peeler across surface of 1 oz. BAKER'S Semi-Sweet Chocolate to form shavings. Fill mugs with ingredients as directed; top with shaved chocolate.